Learn what is meant by the term gas laws. Learn and apply Boyle’s law. Learn and apply Charles’s law. When seventeenth-century scientists began studying the physical properties of gases, they noticed simple relationships between some of the measurable properties of gases. Take pressure (P) and volume (V), for example. Scientists noted that for a given amount of a gas (usually expressed in units of moles [n]), if the temperature (T) of the gas is kept constant, pressure and volume are related: as one increases, the other decreases. As one decreases, the other increases. We say that pressure and volume are inversely related. This equation is an example of a gas law. A gas law is a simple mathematical formula that allows you to model, or predict, the behaviour of a gas. This particular gas law is called Boyle’s law, after the English scientist Robert Boyle, who first announced it in 1662. Figure 6.1 Boyle’s Law shows two representations of what Boyle’s law describes. A piston having a certain pressure and volume (left piston) will have half the volume when its pressure is twice as much (right piston). One can also plot P versus V for a given amount of gas at a certain temperature; such a plot will look like the graph on the right. Boyle’s law is an example of a second type of mathematical problem we see in chemistry—one based on a mathematical formula. Tactics for working with mathematical formulas are different from tactics for working with conversion factors. First, most of the questions you will have to answer using formulas are word-type questions, so the first step is to identify what quantities are known and assign them to variables. Second, in most formulas, some mathematical rearrangements (i.e., algebra) must be performed to solve for an unknown variable. The rule is that to find the value of the unknown variable, you must mathematically isolate the unknown variable by itself and in the numerator of one side of the equation. Finally, units must be consistent. For example, in Boyle’s law there are two pressure variables, and they must have the same unit. There are also two volume variables; they also must have the same unit. In most cases, it won’t matter what the unit is, but the unit must be the same on both sides of the equation. A sample of gas has an initial pressure of 2.44 atm and an initial volume of 4.01 L. Its pressure changes to 1.93 atm. What is the new volume if temperature and amount are kept constant? We are given another quantity, final pressure of 1.93 atm, but not a final volume. This final volume is the variable we will solve for. Does this answer make sense? We know that pressure and volume are inversely related; as one decreases, the other increases. Pressure is decreasing (from 2.44 atm to 1.93 atm), so volume should be increasing to compensate, and it is (from 4.01 L to 5.07 L). So the answer makes sense based on Boyle’s law. If P1 = 334 torr, V1 = 37.8 mL, and P2 = 102 torr, what is V2? As mentioned, you can use any units for pressure or volume, but both pressures must be expressed in the same units, and both volumes must be expressed in the same units. A sample of gas has an initial pressure of 722 torr and an initial volume of 88.8 mL. Its volume changes to 0.663 L. What is the new pressure? The volume is increasing, and the pressure is decreasing, which is as expected for Boyle’s law. If V1 = 456 mL, P1 = 308 torr, and P2 = 1.55 atm, what is V2? There are other measurable characteristics of a gas. One of them is temperature (T). 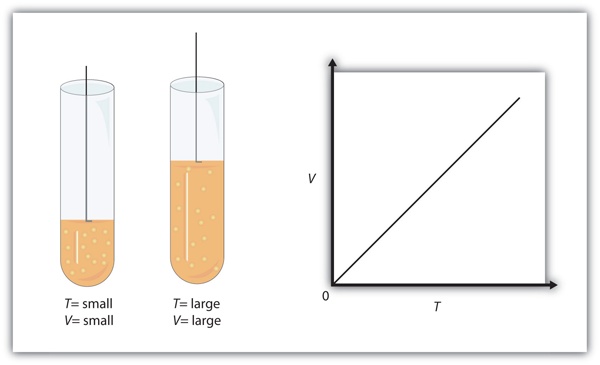 One could vary the temperature of a gas sample and note what effect it has on the other properties of the gas. Early scientists did just this, discovering that if the amount of a gas and its pressure are kept constant, then changing the temperature changes the volume (V). As temperature increases, volume increases; as temperature decreases, volume decreases. We say that these two characteristics are directly related. where K represents the temperature in kelvins, and °C represents the temperature in degrees Celsius. 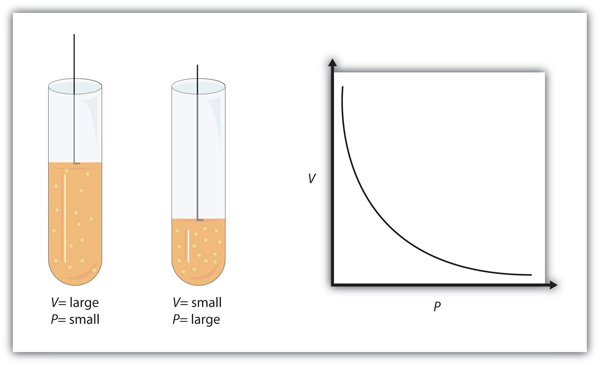 Figure 6.2 “Charles’s Law” shows two representations of how Charles’s law works. A piston having a certain volume and temperature (left piston) will have twice the volume when its temperature is twice as much (right piston). One can also plot V versus T for a given amount of gas at a certain pressure; such a plot will look like the graph on the right. A sample of gas has an initial volume of 34.8 mL and an initial temperature of 315 K. What is the new volume if the temperature is increased to 559 K? Assume constant pressure and amount for the gas. Does this answer make sense? We know that as temperature increases, volume increases. Here, the temperature is increasing from 315 K to 559 K, so the volume should also increase, which it does. If V1 = 3.77 L and T1 = 255 K, what is V2 if T2 = 123 K? It is still an equality and a correct form of Charles’s law, but now the temperature variable is in the numerator, and the algebra required to predict a final temperature is simpler. A sample of a gas has an initial volume of 34.8 L and an initial temperature of −67°C. What must be the temperature of the gas for its volume to be 25.0 L? This is also equal to −125°C. As temperature decreases, volume decreases, which it does in this example. If V1 = 623 mL, T1 = 255°C, and V2 = 277 mL, what is T2? The behaviour of gases can be modelled with gas laws. Charles’s law relates a gas’s volume and temperature at constant pressure and amount. In gas laws, temperatures must always be expressed in kelvins. Define gas law. What restrictions are there on the units that can be used for the physical properties? What unit of temperature must be used for gas laws? Boyle’s law relates the _____________ of a gas inversely with the ___________ of that gas. Charles’s law relates the _____________ of a gas directly with the ___________ of that gas. What properties must be held constant when applying Boyle’s law? What properties must be held constant when applying Charles’s law? A gas has an initial pressure of 1.445 atm and an initial volume of 1.009 L. What is its new pressure if volume is changed to 0.556 L? Assume temperature and amount are held constant. A gas has an initial pressure of 633 torr and an initial volume of 87.3 mL. What is its new pressure if volume is changed to 45.0 mL? Assume temperature and amount are held constant. A gas has an initial pressure of 4.33 atm and an initial volume of 5.88 L. What is its new volume if pressure is changed to 0.506 atm? Assume temperature and amount are held constant. A gas has an initial pressure of 87.0 torr and an initial volume of 28.5 mL. What is its new volume if pressure is changed to 206 torr? Assume temperature and amount are held constant. A gas has an initial volume of 638 mL and an initial pressure of 779 torr. What is its final volume in liters if its pressure is changed to 0.335 atm? Assume temperature and amount are held constant. A gas has an initial volume of 0.966 L and an initial pressure of 3.07 atm. What is its final pressure in torr if its volume is changed to 3,450 mL? Assume temperature and amount are held constant. A gas has an initial volume of 67.5 mL and an initial temperature of 315 K. What is its new volume if temperature is changed to 244 K? Assume pressure and amount are held constant. A gas has an initial volume of 2.033 L and an initial temperature of 89.3 K. What is its volume if temperature is changed to 184 K? Assume pressure and amount are held constant. A gas has an initial volume of 655 mL and an initial temperature of 295 K. What is its new temperature if volume is changed to 577 mL? Assume pressure and amount are held constant. A gas has an initial volume of 14.98 L and an initial temperature of 238 K. What is its new temperature if volume is changed to 12.33 L? Assume pressure and amount are held constant. A gas has an initial volume of 685 mL and an initial temperature of 29°C. What is its new temperature if volume is changed to 1.006 L? Assume pressure and amount are held constant. A gas has an initial volume of 3.08 L and an initial temperature of −73°C. What is its new volume if its temperature is changed to 104°C? Assume pressure and amount are held constant. A gas law is a simple mathematical formula that allows one to predict the physical properties of a gas. The units of changing properties (volume, pressure, etc.) must be the same. This work (Gas Laws by Jessie A. Key) is free of known copyright restrictions.